My mother has a lot to answer for. Her worst crime was sending me to gymnastics class in a leotard. A close second are the Day-Glo strips Grandma Chimp sewed into my parka. In the 80s, all the cool kids had parkas. The best ones were blue with hoods that appeared to have dead ferret edging. If it snowed and you wore your blue parka, you were Han Solo in The Empire Strikes Back. You were the wookie’s nuts. Back then, kids were still allowed to walk to school without a full health and safety assessment and written permission from social services. So walk to school I did. Grandma Chimp was happy her eldest son was getting some exercise, but became convinced I was going to be mown down outside the school gates. So she got out her sewing kit, and did something to my parka I’m still struggling to forgive. The mickey-taking went on for weeks. One day, a kid I’d never met before came up and kicked me in the shins. But still my mother made my wear the damn thing. The scars from this childhood trauma left me with an aversion to any kind of hi-vis clothing. When I got into cycling in my twenties I avoided anything bright or gaudy on the basis that skin-tight Lycra was embarrassing enough without looking radioactive. This lasted right up until the night when, cycling home from work, I went over the bonnet of a car. The moments either side of the crash were nobody’s finest hour. The driver edged forward out of a side junction. I was on the main road, cycling towards him. I looked straight at him and he stopped. ‘He’s seen me,’ I thought. Only he hadn’t. Just before I reached the junction he edged forward again, but by this time I had no chance to stop. I swerved and braked but still hit the bonnet hard. I ended up in a crumpled heap on the opposite side of the road. I wasn’t badly hurt, but had just about the biggest sense of humour failure ever. I bellowed expletives so loudly I had a sore throat for the next three days, and started thumping the roof of his car, oblivious to his crying children in the back seat. When I calmed down to the point I no longer wanted to kill anyone, I went to sit by the side of the road, and started to shake uncontrollably. Once sure I wasn’t going to thump him or terrorise his kids, the driver came over and said – you’ve guessed it – ‘Sorry mate, I didn’t see you.’ Apparently because I wasn’t lit up like a Christmas tree I was all but invisible. To be fair, he did pay for a new wheel, front fork and jacket. But while acknowledging the accident was his fault, he felt it might have been avoided if I’d had better lights and reflective clothing. I still think the accident was the driver’s fault, but it did make me think about the choices I make when I ride a bike. My favourite winter jacket is white, and has lots of reflectives. When I ride at night my bike is now kitted out with the best lights I can afford. 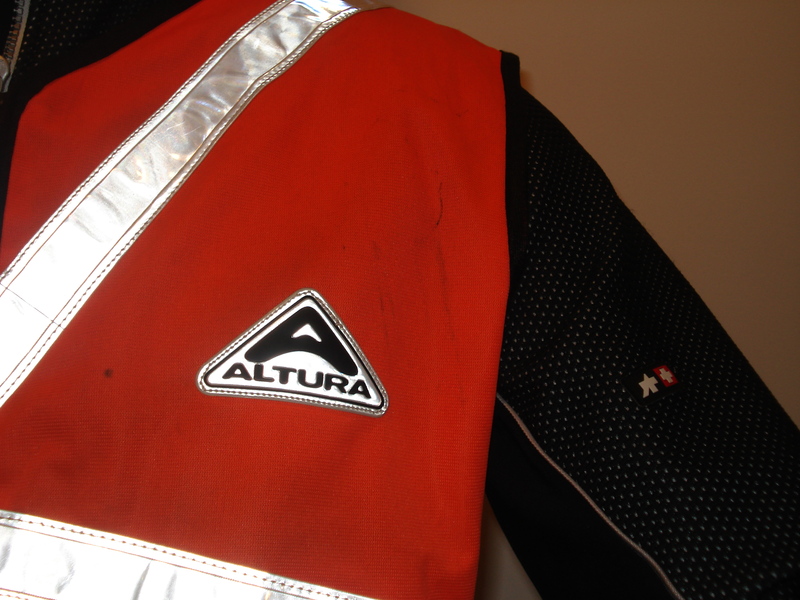 And if I do wear my old black Assos jacket, I usually put a high-vis vest over the top. Maybe Grandma Chimp was right, even if she did ruin that parka. Click to subscribe to this blog and receive email notifications whenever Bike Chimp grunts or scratches his bottom.